Theist Gary Shadle, in his posted essay listing 888 reasons why he cannot accept Christianity, makes a powerful point when he argues how strange the Biblical world is when compared to reality. Indeed, the stories in the Bible, from Genesis, where God creates the world and everything on it in six days, and places it in the center of a universe which he created as a second thought on a single day, are incredibly silly. Next this crazy God places the first man and woman in a lovely garden but then condemns them to a life of torment because, like innocent little children they did the one thing He ordered them never to do. So what did he expect was going to happen? Suppose the story was true (which it isn't). They were but innocent babes with fantastic minds. They were exploring their environment and trying out things. And if we were in their shoes (as if they had shoes) we all know we would be tempted to find out what is behind the locked door. So God says don't eat the fruit . . . and right away, that is where the mind takes us. Before the day is out we are going to take a bite. Not only were Adam and Eve condemned, but all of their descendants were equally marked by their damaged DNA. Consequently, without submitting completely to a bloody worship of God that involves slaughtering thousands and thousands of sheep, people live in fear of spending an eternity in a fiery demonic place called Hell just for living normal lives and being related to Adam and Eve. God’s remedy for all of this torment, which He indirectly created, was to kill his own son because he can’t think of a better way to forgive people for their “sins.” If you look at the psychology of the so-called sin, God set them up. The whole thing was His fault. He set the trap and they fell into it. Other magical things: Angels came down to Earth and talked to people. Moses parted the Red Sea so the Hebrew people could escape the pursuing Egyptian soldiers. God dropped food from the sky to keep the Hebrews alive during the 40 years they wandered aimlessly in the desert. Jesus raised Lazarus from the dead. Dead people rose from their graves and walked around talking to people. A baby was born to a woman who was married but still a virgin. Jesus walked on water. Animals could talk to people. God talked to people. 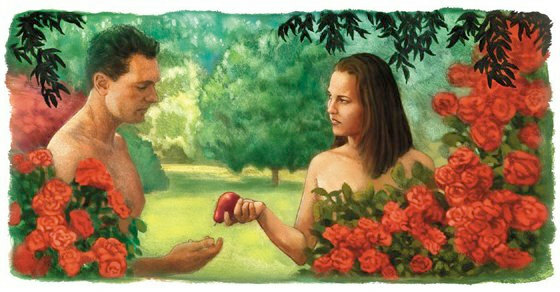 During my youth, when I was listening to all of these wild Bible stories in Sunday School, I was amazed to learn that God actually talked to Adam and Eve, Moses, and various other “saints.” It struck me as curious that God was no longer finding it necessary to drop in and say howdy to us . . . just to assure us that He was still in charge. Other than a few crazy people who claimed that God instructed them in dreams to go on killing sprees, we don’t ever hear of cases where this God is talking to anybody now-a-days. We have to agree with Shadle’s conclusions that the stories were “superstitious beliefs” of a time when people did not understand the workings of the world and the stars, and were making up stories in an attempt to explain it all. But the stories just don’t fit in today’s world where we know civilizations existed for hundreds of thousands of years, that humanoids lived with the dinosaurs and that we either evolved from apes or were planted on Earth by a visiting intelligent life from the stars. There is a lot of stuff we still don’t understand about our origins, but the answers are not in the Bible.